Many clinicians and researchers are convinced that there is an overlap between affective and schizophrenic spectra. In this book, an international team of experts discuss aspects of comorbidity, genetic models, clinical course, phenomenology and therapies. 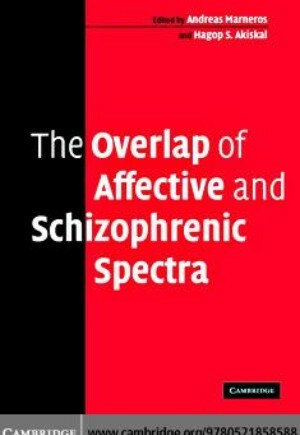 This is the first comprehensive overview of the schizoaffective spectra. Challenging cases presenting clinical and paraclinical features of both spectra are surprisingly numerous. Not only the phenomenology but also the course, outcome and treatment of such cases have their own characteristics. Recent research shows that the overlap also involves genetics and biological processes related to psychotic disorders. Within the overlap of affective and schizophrenic spectra it is possible to identify some groups of disorders having similar clinical and non-clinical features: the 'schizoaffective' group, 'Acute and Transient Psychotic Disorder' or 'Brief Psychosis', and other groups found in so-called 'Atypical Forms'. 1. The paradigms of the overlapping of the affective and schizophrenic spectra: schizo-affective conditions Andreas Marneros; 2. The overlapping of the spectra: overlapping genes and genetic models John R. Kelsoe; 3. The continuum of psychosis and its genetic basis T. J. Crow; 4. Functional psychoses - molecular-genetic evidence for a continuum Hans H. Stassen, Christian Scharfetter and Jules Angst; 5. State- and trait-related deficits in sustained attention in bipolar disorder: are there any overlaps with schizophrenia? Luke Clark; 6. The concept of schizoaffective disorder - utility versus validity and reliability: a transcultural perspective Ahmed Okasha; 7. Phenomenological approaches to the schizoaffective spectrum William Coryell; 8. Clinical course of schizoaffective disorders M. Reinares, E. Vieta, A. Benabarre and A. Marneros; 9. Depressive syndromes in schizophrenia Wolfgang Gaebel, Ellen Bittner and Wolfgang Wölwer; 10. The overlapping of the spectra - brief and acute psychoses Frank Pillmann and Andreas Marneros; 11. Overlapping of the spectra: physical comorbidity between schizophrenia and affective disorders William S. Stone, Andrea H. Roe and Ming T. Tsuang; 12. The overlapping of the spectra: suicide Simavi Vahip; 13. Biological treatment of schizoaffective disorders Christopher Baethge; 14. Psychological therapies and shizoaffective disorders Jan Scott; 15. Epilogue: the interface of affective and schizophrenic disorders: a cross between two spectra? Hagop S. Akiskal.